The misery for the Harriers fans continued to mount today when the team captain, Mark Creighton, joined Oxford Utd for an un-disclosed nominal fee. In other words no more than �10,000. This shock move came following yesterdays news that eight players had been released without being offered a new contract and even more are thinking over their futures with a club that has no ambition anymore and is cast iron certain to go part time sometime before the new season starts on August 8th. A week ago Creighton spoke to the press about Mark Yates hesitation in signing a new contract and told the Express & Star that if the management team were to leave then a lot of players would follow them, including himself. Ironically Yates and Howarth agreed to sign a short one year contract and Creighton still walked out on the club in search of the dollar and the chance to play at a higher level. Someone forgot to advise him about the stupidity of his actions in signing for a club in the same division as us and who could well be in financial troubles on a scale far greater than Kidderminster Harriers problems. 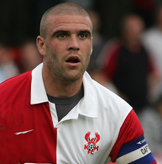 Creighton joined the club in June 2006 from Redditch Utd after formerly being part of the Harriers Youth Team back in 1999. He then moved around the lower echelons of the local scene before Mark Yates bought him to Aggborough. In all he played 160 times for us, scored seven goals and got sent off twice. We wish him luck at his new club but I feel he may have made a mistake.